The Marldon rolling ring traverse unit converts rotary motion into linear travel. 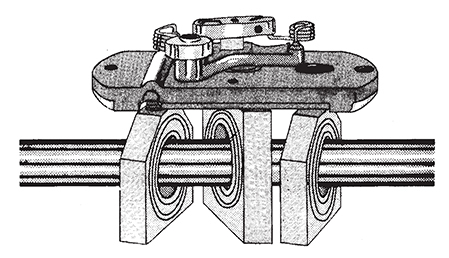 Rotating rolling ring bearings with a specially shaped inner race, spring loaded against a smooth round shaft and maintained under constant pressure, convert the rotary motion of the shaft into linear movement at a rate that is proportional to the angular position of the rolling bearing set relative to the shaft axis. A simple adjustment of this angle by a regulating mechanism allows a wide range of traversing speeds while the shaft speed remains constant. The unit is self reversing, so the direction of the shaft rotation does not need to be reversed to effect travel in the opposite direction. The place where reversal occurs is dictated by the position of stops adjacent to the shaft which reverse the angle of the bearing set on contact. 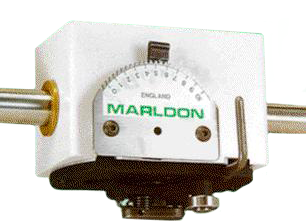 The Marldon rolling ring traverse unit converts rotary motion into linear travel. Rotating rolling ring bearings with a specially machined inner race, spring loaded against a smooth round shaft and maintained under constant pressure, convert the rotary motion of the shaft into linear movement at a rate that is proportional to the angular position of the rolling bearing set relative to the shaft axis. Picture A simple adjustment of this angle by a regulating mechanism allows a wide range of traversing speeds while the shaft speed remains constant.